Fans Want Patriots' Draft Pick Restored And Sue NFL To Make It Happen : The Two-Way The NFL took away the Patriots' first-round draft pick as punishment for Deflategate. Fans say the team shouldn't be penalized while the case is on appeal. 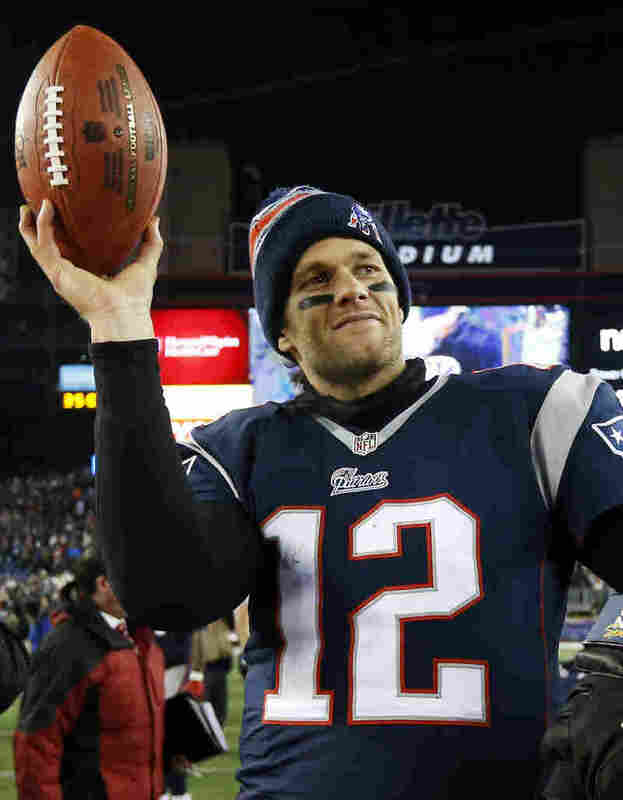 Patriots quarterback Tom Brady holds the game ball after a playoff game against the Ravens in January 2015. A week later, the team would be accused of deliberately deflating footballs in the AFC Championship game against the Indianapolis Colts. A group of die-hard Patriots fans went to federal court earlier this week trying to overturn the team's punishment for Deflategate. The Patriots were stripped of their first-round draft pick after the NFL found the team improperly deflated footballs in the Jan. 18, 2015, AFC Championship game against the Indianapolis Colts. Fans say the team shouldn't be punished while the case is on appeal. "That's not fair, you know. We gotta think long-term here," says Mike Dimauro, one of seven plaintiffs accusing the NFL of fraud, negligence and inflicting emotional distress. Commissioner Roger Goodell and Patriots owner Robert Kraft are also named in the suit. The complaint says the league and Goodell relied on "false premises and biased 'investigations'" in handing down punishment, which also included a $1 million fine and a four-game suspension for quarterback Tom Brady. Brady's suspension remains under appeal. The suit criticizes Kraft for not fighting the league's punishments harder. "Defendant Robert Kraft had remedies to attempt to get plaintiffs' draft pick back, but he chose his fellow billionaire owners above the plaintiffs and fellow fans," the suit said. Fan Mike Dimauro says he's lost sleep and can't bear to follow his team. "It's too bothersome for me — it leaves a big hole in my heart." Plenty members of Patriots Nation can relate. "When I saw it, I wanted to actually say, 'Can I add my name on that lawsuit?'" says Norm Wright, interviewed at a sports pub last night. Wright agrees the NFL has unfairly subjected Pats fans to taunting and ridicule. "We didn't do anything wrong." "Letting the powerful oppress us when we've done nothing wrong is about as un-American as it gets," attorney Seth T. Carey, who filed the suit on behalf of the fans, said in a statement. "That attitude is the polar opposite of what the real patriots fought and died for on the very ground that NFL owners sit while they rake in billions of dollars from us fans." Representatives for the Patriots and the NFL did not respond to requests for comment. The lawsuit's claim that the NFL is subjecting Patriots fans to ridicule, has prompted ridicule from another source — rival New York fans. Rich Schiller says, "It's about the most ridiculous thing I've ever heard, actually." Experts say they don't expect the fans' suit to get very far downfield.